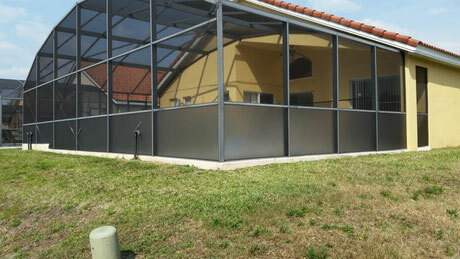 Florida Glass is a vinyl laminated fiberglass screen. The material does not have any holes, unlike standard fiberglass screen material. Also called vinyl windows. Most commonly, Florida Glass is used in the bottom row of pool screen enclosures to offer a privacy barrier to those using the pool area. When installed, it has an opaque appearance, which limits the visibility from outside the enclosure, but still allows light to penetrate through the screen. Also used in Florida rooms for similar reasons. Some folks use it to completely screen in their Florida room from the elements. What are the benefits of using Florida Glass? 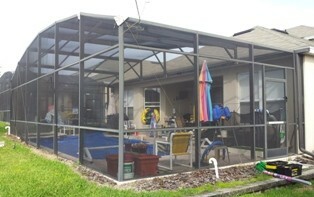 We have also been asked to install Florida Glass to screen enclosures adjacent to foreclosed properties, to prevent homeowners or guests from seeing unsightly green pools or weed ridden decks. 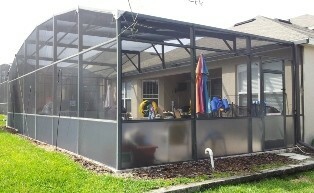 Florida Glass can also be used as a weather barrier to prevent rain blowing into screen enclosures.